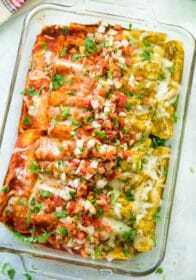 This is my all-time favorite Fast & Easy Chicken Enchiladas recipe, made with red and green enchilada sauce, so that you get the best of both worlds! 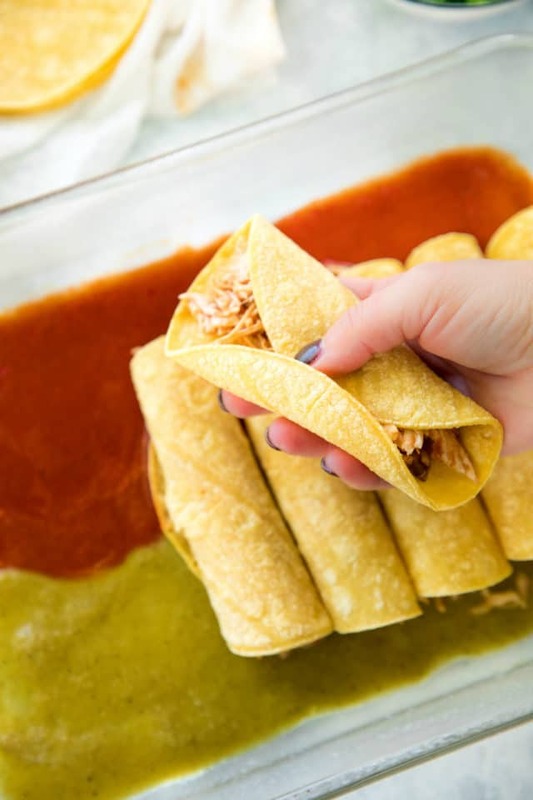 Soft and delicious Mission® Super Soft Corn Tortillas filled with shredded cheese, chicken and salsa, these come together so easily and they will definitely become a family favorite Mexican dinner. I’m always on the search for new recipes that I know my whole family will love as much as my Baja Fish Tacos and Spaghetti and Meatballs. Then it hit me, I’ve never shared my Fast & Easy Chicken Enchiladas with you guys before. We need to change that right away! This super simple, delicious, family favorite dinner recipe is pieced together with shredded chicken (I like using rotisserie), shredded cheese, enchilada sauce (we love using red and green!) and Mission® Super Soft Corn Tortillas. I’m sharing more below, but one reason I love Mission® Super Soft Corn Tortillas are because they come from Mission’s Maseca corn flour, which is the highest quality corn flour available. Everyone leaves the dinner table happy, after this meal! 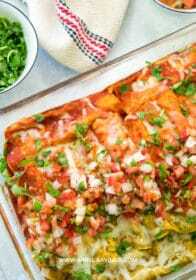 I love making these red and green enchiladas for dinner on Christmas Eve or really for any family celebration. So pretty and festive! And they are easier than you might think. Follow along and I’ll show you how. The first step is to gather all of your ingredients, preheat the oven and prepare your 9×13″ baking dish. Spray it with cooking spray and then spread on some of the enchilada sauce – green on half and then red on half, lengthwise. Now mix up the chicken and cheese filling. 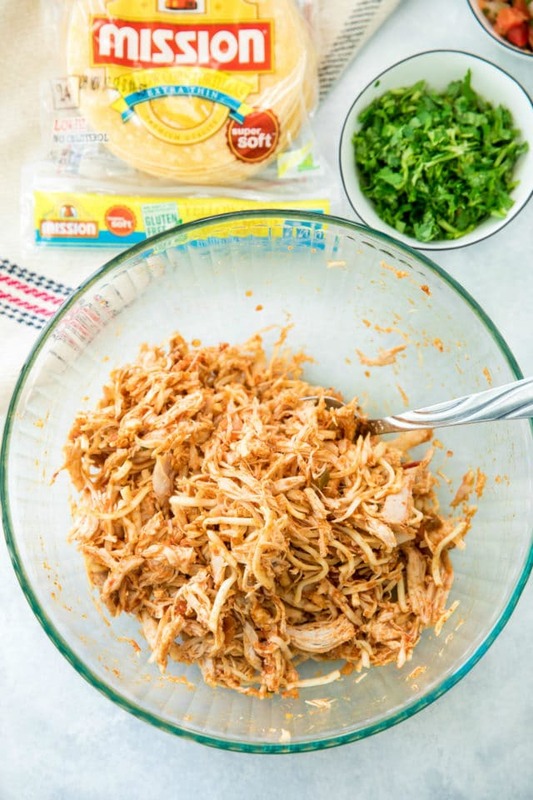 It’s so simple – combine shredded rotisserie chicken (or any cooked chicken) with cheese (I like to use a light variety of mozzarella), taco seasoning and salsa. 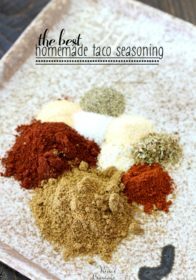 Here is a homemade taco seasoning recipe and a homemade salsa recipe, if desired. I kept it really easy and used store bought of both. It’s time to grab the Mission® Super Soft Corn Tortillas! I warm them for best taste and to make them more pliable for rolling. You’ll find heating instructions on the package. I used the microwave instructions, and wrapped 5 at a time in a damp paper towel and microwaved them for about 30 seconds. Next, add a good amount of filling in each tortilla and roll it up. 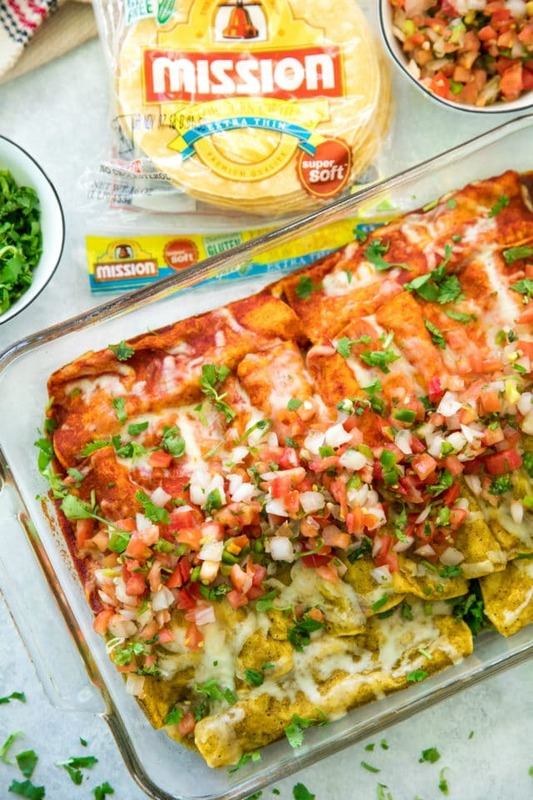 Mission® Super Soft Corn Tortillas are super versatile and definitely the best ones for this dish, but also for any of your other Mexican dishes. I love that they’re low-fat, with no lard and no cholesterol. They can be conveniently found in the bread and/or tortilla in almost any grocery store, nationwide. 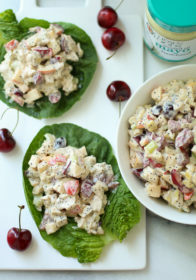 Click here for more tasty recipes and a store locator! 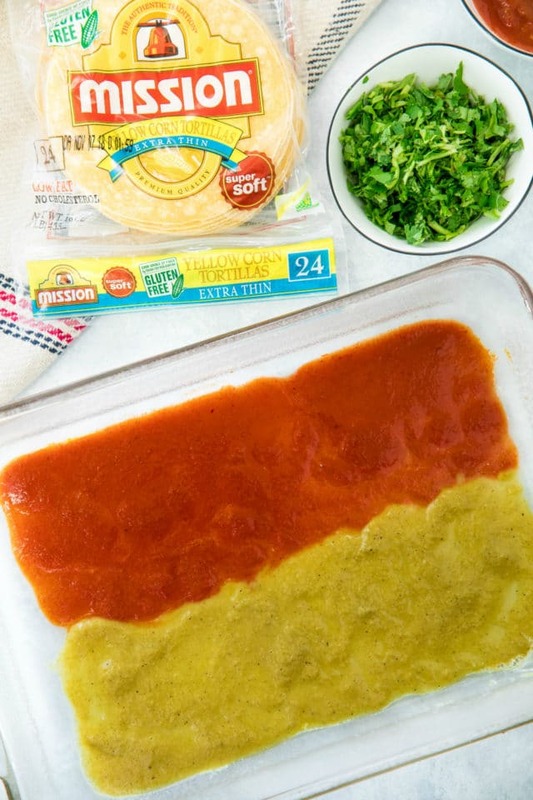 Place rolled tortillas in the center of the baking dish (half of the tortilla should be in the green sauce and half should be in the red sauce). I also had room in my baking dish to add two enchiladas down the sides of the baking dish, as you can see in the photos. When you have all 14 rolled tortillas placed in the baking dish, add the remainder of the two different enchilada sauces over the top. Add green sauce over the same side you added green sauce on the bottom of the pan, and do the same with the red sauce. Don’t worry if you end up with extra chicken/cheese filling. 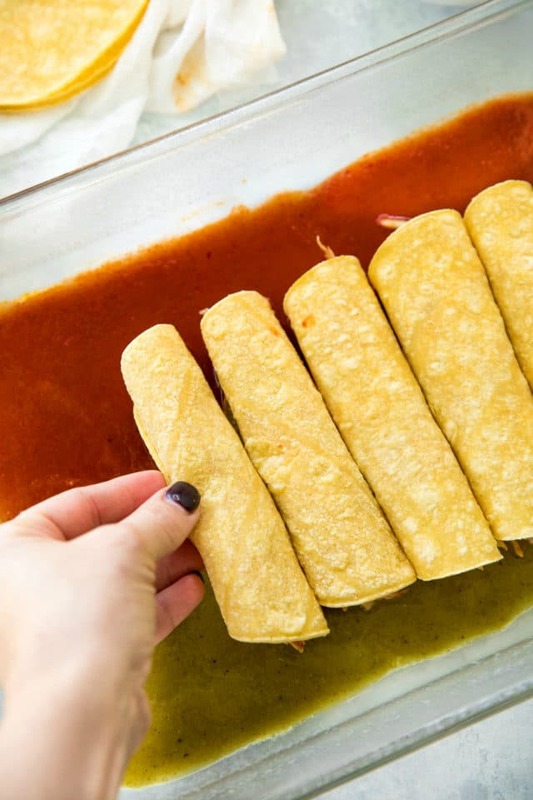 You can sprinkle it over the top of the rolled tortillas, or you can save it for something else. Sprinkle the reserved cheese over the top and feel free to add any other toppings you would like to be cooked on the enchiladas. I think black olives would be a great addition. Just to note, I added the pico de gallo and fresh cilantro after cooking the enchiladas and after they had cooled slightly. Enchilada Sauce? NEVER put the enchilada sauce on the INSIDE of the tortillas. You’ll be sauce overloaded. You can certainly use your favorite sauce. I like the red and green because it’s festive and different flavor options are always great, but if green is your favorite, just substitute the green for red. Flour or Corn Tortillas? I’m team corn tortilla and so is my hubby. The size of the Mission® Super Soft Corn Tortillas is just perfect for this dish. I also think corn tortillas hold up better with all of the sauciness. No soggy tortillas here! 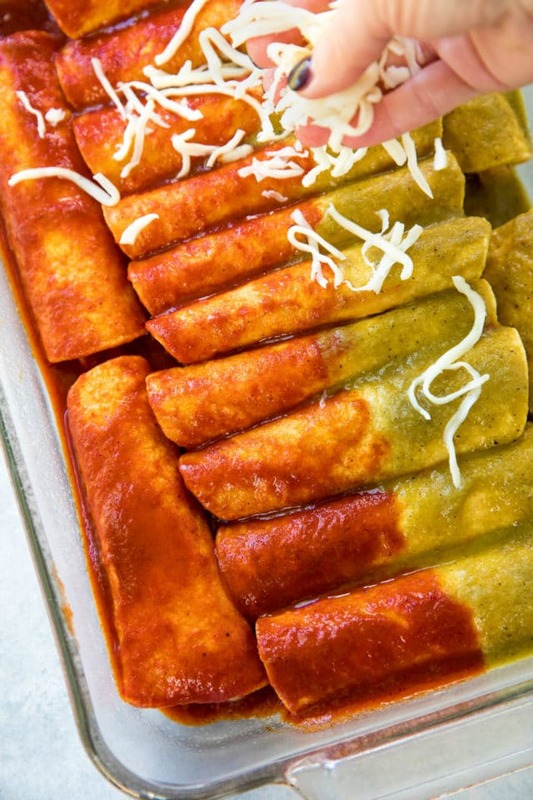 Can you freeze enchiladas? YES! 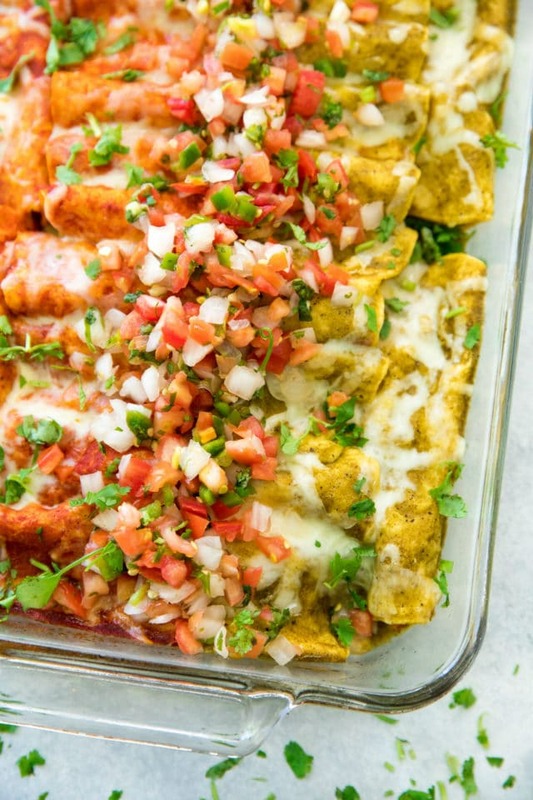 You can definitely prepare these enchiladas and then freeze before baking. 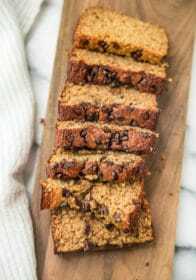 Perfect for making ahead of time! 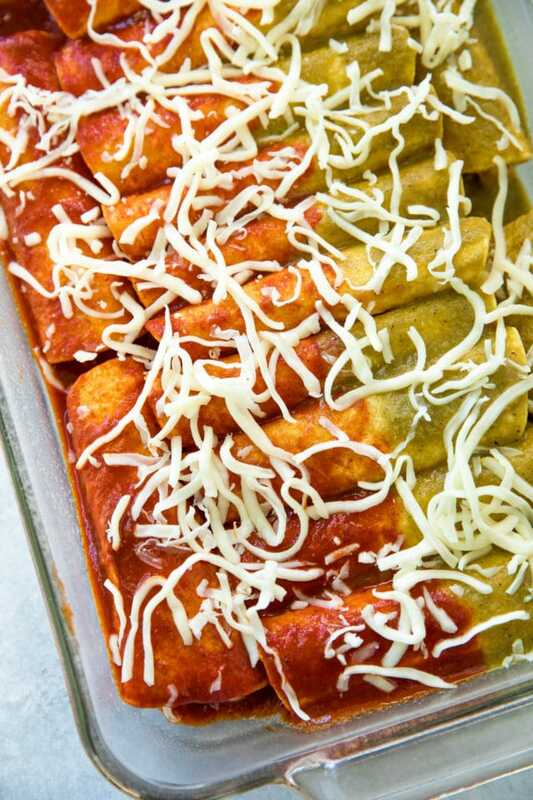 One of the best things about these enchiladas is that the cook time is only 30 minutes. Start to finish, you can get this on the table in about 45 minutes. Pretty great for yummy, homemade chicken enchiladas! any desired toppings: diced tomato, chopped cilantro, avocado, sour cream, etc..
Preheat oven to 350ºF. Lightly spray 9x13" glass dish with nonstick cooking spray. Spread about 4 tablespoons of red enchilada sauce in the top half of the baking dish, lengthwise. Spread about 4 tablespoons of green enchilada sauce in the bottom half of the baking dish. Set aside. In a large bowl, stir together shredded chicken, taco seasoning, 2/3 of the shredded cheese and the salsa. Prepare corn tortillas, about 5 at a time, in between a damp paper towel and in the microwave for about 30 seconds. This will keep them from cracking when you roll them. Fill corn tortillas evenly with chicken/cheese filling, and roll and place into pan. Pour remaining red enchilada sauce over top the top half of the enchiladas. Pour remaining green enchilada sauce over the bottom half. Sprinkle with remaining cheese. Bake covered with foil* for 30 minutes or until hot and melty. Top with any desired toppings and serve. *spray foil with nonstick cooking spray before covering pan of enchiladas to prevent cheese from sticking. MAKE GLUTEN FREE: Use Mission® Super Soft Corn Tortillas like I did and this recipe will be gluten free. 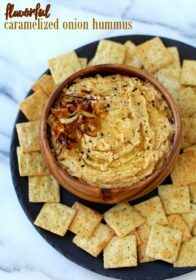 MAKE DAIRY FREE: Use a dairy free cheese variety. FREEZER OPTION: Prepare enchiladas and then cover tightly with plastic wrap, then aluminum foil. Freeze up to 3 months. To bake, remove plastic wrap, cover with foil and bake for 30 minutes. Uncover and, if needed, bake for an additional 5-10 minutes, or until completely cooked through. MAKE AHEAD OPTION: Cover prepared enchiladas tightly with plastic wrap. Refrigerate up to 24 hours. To bake, remove plastic wrap, cover with foil and bake for 30 minutes. enchiladas are just the best. I love that you can make them ahead. it makes things so much easier. top with a little sour cream and this is perfection! 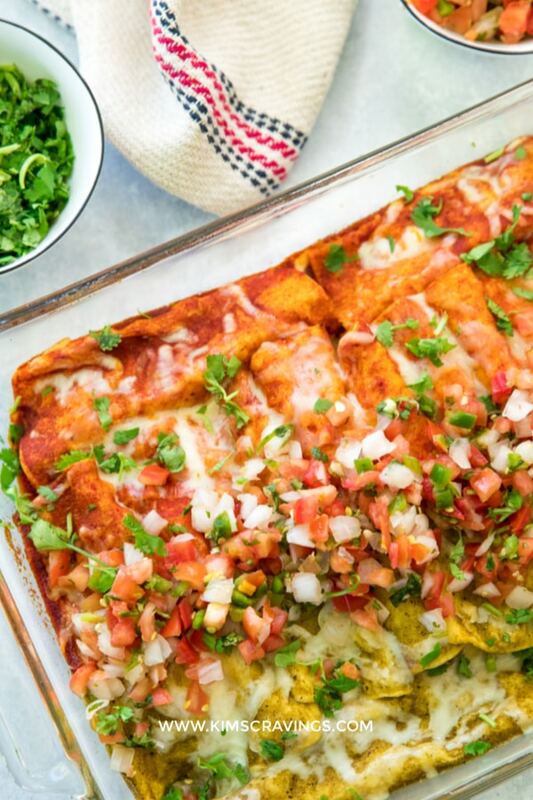 Enchiladas are one of our favourite family meals and these look absolutely delicious. A fab option for a weeknight meal. 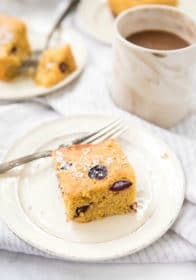 my husband loves mexican foods, I think I will have to surprise him with this tonight now that I have a great recipe to try right here! I’m always looking for new fast and easy meals to try! I can’t wait to try this one! Such great flavours and love the ease with which this comes together! 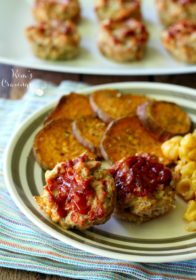 Perfect for a weeknight meal and one that the whole family will love! Thank you! You have given me an idea for dinner tonight! This looks delicious and so colorfully festive! Loved how colorful and enticing it looks. 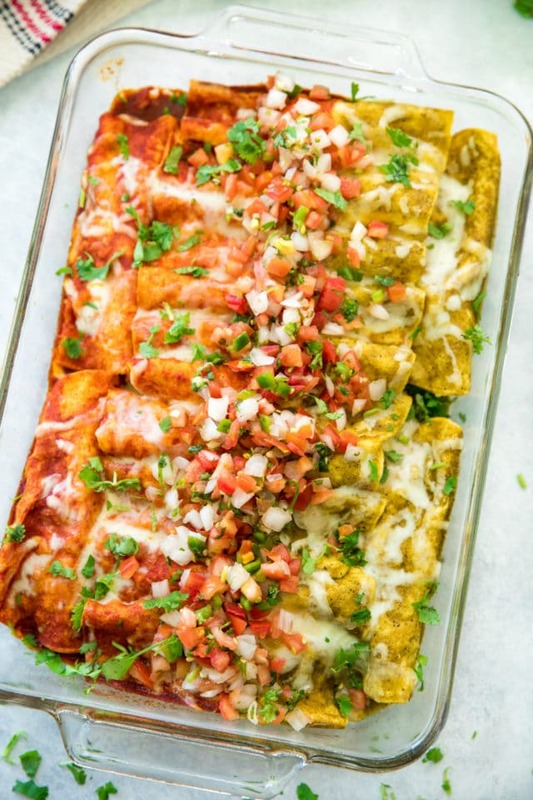 I am sure I can make vegetarian version of these enchiladas using your recipe. Looks very festive. These are so great. I’ve never seen them made with both red and green sauces together. What a great idea! Printing this off right now. Can’t wait to make them. I like that you add both red and green sauce. I’m a green sauce person myself but my wife LOVES red sauce. So this is literally perfect for us haha Thank you! These really were quick and delicious. I didn’t have everything on hand, so I replaced taco seasoning with 2 Tbs chili powder and 1 tsp. cumin, and rolled them up in whole wheat tortillas. I also appreciated the info about never adding the enchilada sauce to the filling to prevent sogginess (definitely a problem I’ve had in the past with other recipes). Thanks for the great recipe! !